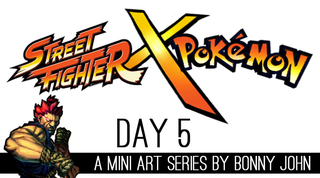 SF x PKMN Mini Art Series Finale! Akuma x _______ ?! When Gouki gave into the Satsui no Hado, the human element of his being grotesquely morphed into the raging demon he is known as today. With nowhere left to turn, the man transformed by The "Surge of Murderous Intent" found solace in a cavern atop a mountain surrounded by a forest. There, Gouki emerged as Akuma after training with his new found power, going on to master the Shun Goku Satsu …The Raging Demon. When Akuma and Ryu crossed paths in the moonlit forest below his cave, a battle would take place that would introduce the denizen of hell to his disciple. Akuma, who longed to awaken the Satsui no Hado in Ryu, began his onslaught in hopes of defeating the prodigal son to near death and force a transformation. With Lucario's help, Ryu's Hado was maintained by the ability of his partner to keep away any imbalance in his good aura. Ryu soon turned the tide of battle and fought Akuma to near death when all of a sudden, the moon seemingly vanished from the sky . A never ending darkness blinded the warriors in the forest turned arena. Was this Akuma's Satsui no Hado reaching new heights? The fighters quickly realized this was beyond any of their control when a ghost like entity began to descend from the air before them. It was an illusion and the being before them was clearly Darkrai, a legendary Pokemon of great power that brought fear to the hearts of those who fell under its nightmare. Ryu and Lucario quickly used the cover of darkness to flee from battle knowing Akuma was injured, and that there was no use to fight any longer. Today, Akuma travels with a devotee – a single Zoroark who views Akuma as a hero that protected his tribe. That night after Akuma's loss, he was tended back to health over the course of a few weeks by the pack of dark type Pokemon. It turned out that Akuma's training and unleashing the ki of the Satsui no Hado was a repellant to many predators and enemies to the Zoroark tribes of the forest and mountain. As dark type Pokemon, the Zoroarks became especially fond of the power, and sought to use it themselves. Although Akuma dismisses the notion of having a partner of sorts, a single Zoroark follows his hero in hopes of acceptance. Akuma, indebted to the tribe for taking care him, allows the creature to follow him as thanks, although he would never admit it. Something else he'd never admit is that he thinks the Zorua are pretty damn cute. In battle, Akuma's murderous intent actually FORCES Zoroark's ability to produce illusions to only create the form of Darkrai – the closest Pokemon that resembles the sheer terror and threatening nature of his aura. Zoroark, who's strong will to prove himself to his master pries through the dark energy to insert a little bit of himself into the illusion – as seen by the hair of Darkrai. Zoroark would easily die for his master so long as it carried any sort of weight in impressing Akuma. Where Bison and Mewtwo have a relationship at complete odds, Akuma and Zoroark have one where it's completely one sided. Akuma, a hermit type warrior is depicted in this story to be a sort of people's champion – the outcast who is seen to be good in the limited point of a community when of course he's far from it. The closest thing I can sort of think of at the moment is like when Prince Zuko of The Last Airbender helps defend an Earth tribe people under a guise. I wanted to make Zoroark desperate, clingy for attention. All the other relationships by the good characters of this series is properly balanced and built on friendship and respect. I envision Akuma to be neglectful and rude, but only to an extent as he owes his life to this tribe of Zoroark that accept him for who he is. Of all the possible Pokemon to do so, I think Zoroarks are the best fit, being Dark type Pokemon who live in forests as he does. On top of that, they also both happen to have similar color palettes and hair styles even! I envision Darkrai/Zoroark acting as a living shadow to the Supreme Master of the Fist. Thus, in the opening intro to his fight, you see Darkrai, the ghost like entity, sort of mirroring the master before he descends around him. The illusion continues throughout the battle, giving Akuma a mental advantage over his opponent. Composition wise, this is the most vertically built illustration of the series, as we see Akuma in his classic pose, channeling his aura. This is seen as his win pose, a taunt, part of his attacks, and is just an iconic image of him. This particular scene is built off of a pose that channels his ki into the kanji that reads "METSU", or destruction. Originally, when I worked on this draft a year ago, there was no kanji and the threads of energy that were flaring from his body formed Darkrai. This time around, I thought it would look immensely more badass if Darkrai formed out of the kanji, destruction itself. So why Darkrai and not Zoroark? For starters, Darkrai is just way cooler, IMO. I mean, I love both of them, and they both fit Akuma very well. Zoroarks ability of creating illusions could work wonders for the battle and gameplay mechanics of this made up game, but Darkrai is practically Akuma in Pokemon form and visually might look better alongside Akuma. I decided to mix the best of both worlds by having Zoroark as a base for the story, and have Darkrai represent him in game – because Darkrai is an illusion, I got a lot of creative leeway. I didn't have to present the official size of the Pokemon, I could have the creature form out of kanji, I could merge Zoroark's design (his hair) into Darkrai, and then some. As I said before, I'm a big fan of both Dakrai and Zoroark, and Akuma is one of my mains in Street Fighter, so I wanted to go all out for the illustration due to favoritism…and then there's the fact that this is sort of a series finale so I had to go out with a bang. I guess that's all that needs to be said. I don't really have to explain the ground cracking underneath pressure and the badass DBZ floating rocks, and I've went into detail with his background so I left it out because the little BG strip would interrupt the kanji and there wasn't any part of the illustration where it looked good. So...I guess this is it! I hope you enjoyed the artwork and the depiction of Akuma and his "partner". I had a blast working on this series at a slower pace than One a Day and coming up with silly little stories to give meaning to the art. As usual, give me your critiques and your thoughts and for the love of all that is holy, someone fight me in SF4 (PS3!) !!! I'm on such a Street Fighter kick it isn't even funny hah.